Last night we celebrated our Slava, and 20 years of being Orthodox. 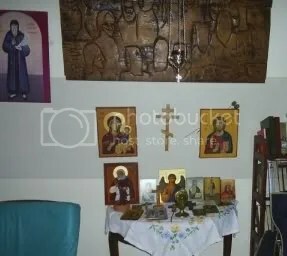 We were received into the Orthodox Church in the community of St Nicholas of Japan, which had just begun meeting at an Anglican church hall in Fairmount, Johannesburg, on 8 November 1987, the feast of St Michael and the Bodiless Powers of heaven. According to Serbian custom, that became our Slava, a day kept as a family name day, commemorating the day on which the first members of the family were baptised. This year we had with us Fr Evsevije (Eusebius), a monk from Sopochani monastery in Serbia, who recently came to work with Father Pantelejmon at St Thomas’s parish in Sunninghill, Johannesburg. 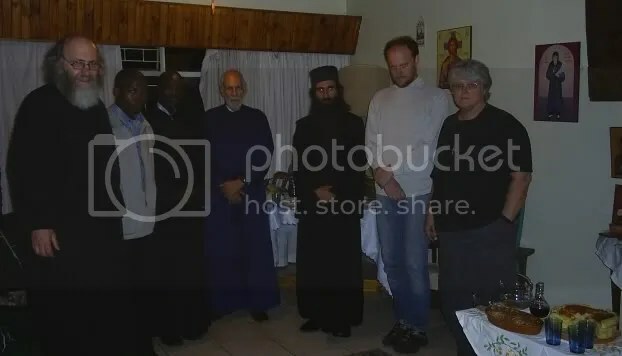 Also present were Fr Athanasius, deputy dean of the Catechetical School in Yeoville, Johannesburg, and Simon Shabangu, a former student of the Catechetical School, and Deacon Irenaeus (Brian) Macdonald and his wife Cathy. Congratuations on the anniversary of your illumination. May God grant you many years!